After four years of volleyball, Kristen Sanchez will graduate this spring having collected the second most digs in school history. Sanchez’s focus helped shatter school history records, ranking No. 7 in service aces with 121, No. 4 in sets played at 414 and No. 2 in digs with 1,969. Sanchez made volleyball her priority, and with the support of some of her most passionate supporters, it is clear to see how she achieved her accolades and established her legacy in the University’s history book. Sanchez was not always the dominant volleyball player she is today. In fact, it was not even her first sport. Sanchez first played soccer and softball in her early years, but it was not until junior high that Sanchez found volleyball. Soccer and softball were fun, but her passion and heart were elsewhere, she explained. While volleyball is vastly different from soccer and softball, Sanchez said it taught her some of the most valuable lessons and played a role in the person she is today. “It’s things like having a team dynamic, learning how to communicate, and working with others,” Sanchez said. 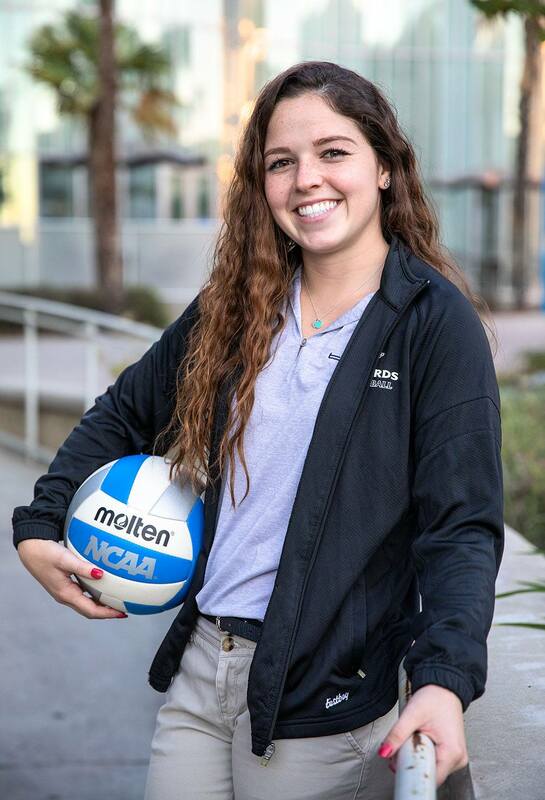 After high school, Sanchez looked for schools that would not only help her succeed in her education, but also give her an opportunity to play volleyball. After talks with Jenna Panatier, the head coach at La Verne, and some volleyball players, Sanchez knew exactly where she wanted to be. La Verne became Sanchez’s destination. The quaint classrooms and community made her feel more at home. Kristen could also play volleyball and her family would be able to come out to support her for more games. “After talking with Jenna and some players I knew it was the school I had to be at, and so far it has been the best decision I’ve ever made,” Sanchez said. Sanchez left her mark on La Verne athletics and volleyball history because just like in volleyball, her numbers don’t lie. In her debut season, Kristen took to the program like a duck to water. She was a starter as a freshman and continuously built on all aspects of her game to show that she had what it takes to make it at the collegiate level. In her sophomore season, Kristen proved herself by making the 2016 second team All-SCIAC. Kristen took it one step further, however, in her junior and senior years, she was not only named a team captain, but also earned a spot on the First Team All-SCIAC for 2017 and 2018. In addition, she also received a 2018 All-West Region Honorable Mention by the American Volleyball Coaches Association. “Her dedication to her craft, our team and our program has dynamically affected her teammates,” said Panatier. However, Sanchez is not the only person with dedication to volleyball. She brings some of the greatest supporters that have ever graced a stadium’s seating: her family. Sanchez’s support system consists of her parents, her older brother, and her No. 1 fan, T.J. Sanchez, who also happens to be her twin. T.J. and Kristen have been two peas in a pod ever since they were kids, and T.J. said he has been screaming his head off for his sister since she played her first serve in high school. He is one her biggest supporters. “As a brother, I got to see the work that she was putting into what she loves,” T.J. Sanchez said. Ever since her freshman year, Kristen Sanchez has been firing on all cylinders, her final stats tally enough to put her in the La Verne history books. Not only did Sanchez excel on the court, she proved she is a double threat academically as well. Kristen was recognized as a University scholar athlete. Sanchez also made the dean’s list in 2015 and 2017 and was a part of the SCIAC All-Academic team in 2015-2017. As the curtain closes on the beloved star’s collegiate career, her actual volleyball career will see the light once more in Brazil when she travels with Panatier and teammate Kelsie Sievers on USA Division III Volleyball Select team. This select team is comprised of 10 players from other Division III schools from across the country. Sanchez will play various clubs and teams from around the world with the select team, after she graduates in spring 2019.